Today’ UN conference was intended to bring together some thought leaders to discuss the Muslims right position in the world community! The speakers addressed some fundamental Islamic concepts such peace, justice love, knowledge, Moderation, service, bridge building, universality and more. Finally the conference came to conclusion and addressed the question of a strategy for Transformation! That was the time I got a chance to speak for few minutes! One was about the strategy of an American founding father Thomas Jefferson who ordered a Quran in English and read it before writing the Declaration of Independence and before deeply influencing the American Constitutional discussion . He kept emphasizing on religious liberty which without a doubt is an Islamic and Quranic order. We need to promote religious liberty in its Islamic and human notion in our diverse Muslim communities and nations. Religious liberty is not just respecting all the sects and schools of thoughts but providing them all an equal opportunity in social and political leadership levels. Another point that I mentioned was what happened to me early this morning while entering the building of UN in New York. First I got my pass from the desk of the conference at the gate but then the security also asked me to show them my photo Id! I checked my wallet, I had every other Business and credit cards but somehow sadly I had left my driver license in the hotel room! Though everyone knew me, representing Islamic House of Wisdom but the security kept asking for photo id, they told me in this case there was no difference between me and the Secretary General of UN, we both need to have a photo id to get in! So I was forced to go back to the hotel in the crazy morning traffic jam of Manhattan and get my photo id in order to join the conference! I shared this interesting story with the conference and concluded that one way to succeed in our Islamic Renascence is to start believing in the rule of law, I admired the security for reminding me this great lesson today! We have so many stories in the life of our prophet and judgements of Imam Ali who acted not only on the rule of love but also the rule of law! Let’s move toward the rule of law so we would never suffer from the dictatorships such as corrupt kingdom of Arabia and it’s satanic sisters! As American citizens we must be promoting the notion of religious liberty and rule of law and protect our country from submitting to the racist forces of hatred, intolerance and division! 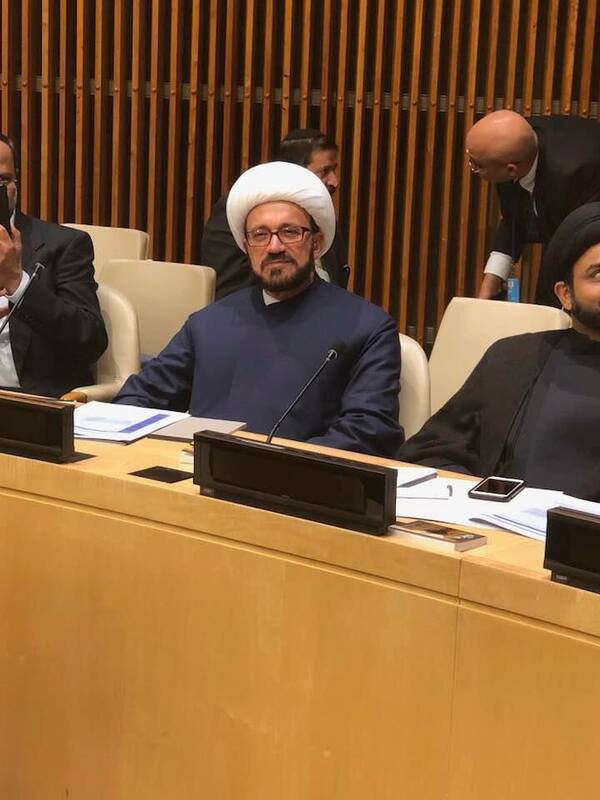 I would like to thank Al-Khoei Foundation and all other organizations who succeeded to have an Islamic and Shia conference at the Headquarter of UN in NYC! Inshaallah this is the first step in our journey of one thousand miles!